A guide and overview to getting engaged in University and student-led groups and events across both campuses. Check out the Support & Resources that help you get engaged, encourage your development, and support your learning. Browse the different categories below or click Opportunities for Engagement above. 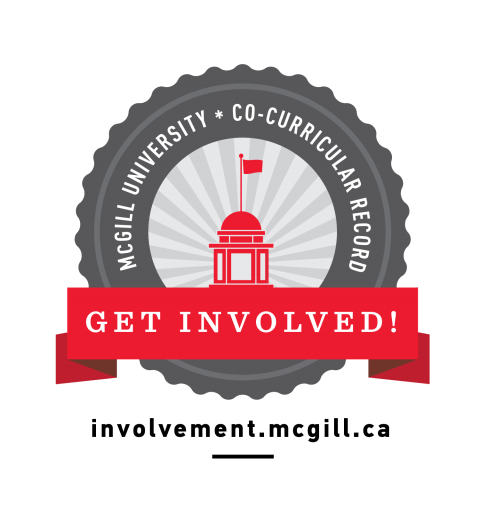 For current McGill students, myInvolvement is a web-based tool designed to showcase workshops, events and volunteer opportunities at McGill. Through this portal, students can search for, register for, and track their participation in eligible out-of-classroom activities through a co-curricular record (CCR). Please note that myInvolvement is still in development and not all University and student-run organizations are currently involved. Check out the Emerging Leaders Program! Our workshops help McGill students with their personal and leadership development! These student-facilitated, 55-minute sessions are a great way to learn more about yourself and your leadership abilities while at university. FIRST-YEAR STUDENTS: Download the Getting Involved Booklet for First-Year Students for suggested engagement opportunities! Also, check out our webinar series for more helpful information.